Considered one of Canada's 10 most beautiful heritage buildings, Montreal's Marché Bonsecours has been standing in its Old Montreal location since the mid nineteenth century. Scroll through the slideshow to see inside and discover must-see attractions and restaurants in the neighborhood. From the city's once-upon-a-time city hall to showcasing made-in-Quebec products in its more than a dozen on-site boutiques selling locally-made fashion, art, and jewelry, Marché Bonsecours also houses exhibit and banquet halls, hosting key annual events, notably the World Press Photo exhibition, Braderie de Mode Québécoise and Quebec's largest chocolate show, Je t'aime en chocolat. Food is also sold on location as the Marché is a fairly high traffic pit stop, with the building located just across the street from the Old Port, one of Montreal's most popular tourist (and staycation) destinations. Inaugurated in 1847, Marché Bonsecours was a cultural and political focal point in Montreal for many moons, having served as City Hall from 1852 to 1878. It also became the city's main farmers market for about a century, until it shut down in 1963, making way for office space until 1992, when the building was repurposed and reopened to the public. Marché Bonsecours might no longer be a public market, but its ground floor is dedicated to shopping, a testament to its past. Find costume jewelry for a steal, discover local designer brands in specializing in apparel, furniture, and art, and find Montreal- and Canada-themed souvenirs. Once you're done browsing Marché Bonsecours, head to St. Paul Street. Art galleries, souvenir shops, and quaint luxury boutiques line the cobblestone road. Across the street from Marché Bonsecours is Notre-Dame-de-Bon-Secours, the site of the oldest chapel in Montreal. Evidence of campgrounds dating back 2,000 years is viewable on-site as is the tomb of a saint, that of Marguerite Bourgeoys. A five-minute stroll away from Marché Bonsecours leads to the Old Port Skating Rink by Bonsecours Basin in the winter and the Clock Tower Beach in the summer. Craving some sugar from all that activity? In the vicinity of Bonsecours Basin heading slightly westward on de la Commune Street, the closest road running parallel to the Old Port is a Beaver Tails counter. Come prepared with an appetite. You'll need it when you see the size of those pastries. From there, keep going west along de la Commune until you end up at the Montreal Science Centre IMAX and Pointe-à-Callière Museum. If it's not too cold and you're up for a ten-minute walk from Marché Bonsecours, consider heading deeper into Old Montreal. You might just stumble upon the most beautiful church in North America. 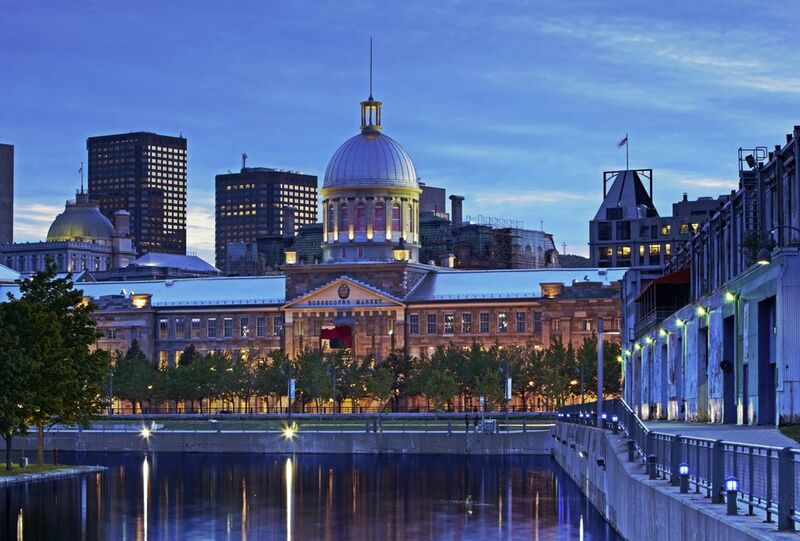 Marché Bonsecours is optimally situated when it comes to fine dining and upscale nightlife. La Champagnerie and its impressive selection of cava, prosecco, crémant, and champagne are just across the street. Or head to nearby Jardins Nelson and spend time lingering on one of Montreal's most beautiful terraces to the sound of live jazz. Old Montreal's Modavie is another live jazz dining option. Close by is also Les 400 Coups, one of Montreal's most romantic restaurants, and it happens to also be on of the best foodie destinations in the city. Also on that best-of date night list and in the neighborhood are Auberge St. Gabriel and Barroco. Prefer a night of saké and izakaya pub grub? Try Kyo. Looking for cheap eats? You won't find them in Old Montreal. Walk ten minutes to Chinatown instead where affordable dining, trending tiki nightlife, and super cheap bites are the norm.